It is without a doubt the most amazing device for hanging signs from the ceiling. And no more ladders! The pole is light weight, but extremely sturdy. They extend to over 8', 10' and 18' and easily reach tall ceilings. No more stretching to reach clips on ceiling grids. Store staff will love how easy it is to use; and it is SAFER than climbing ladders which put the staffs well-being in jeopardy. The cost is minimal compared to a lost time claim (or worse). 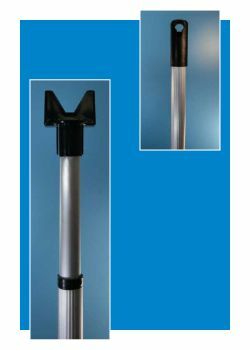 With our Telescoping Installation Poles you will also see an increase in productivity (less hours invested to hang signs), a decrease in signs falling and breaking/bending due to a staff member losing grip while up in the air, much less chance of a workers compensation claim arising due to slips and falls from ladders and your staff members actually looking forward to sign hanging versus avoiding the task due to the potential hazards involved. 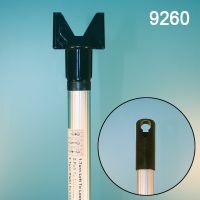 Minimum quantity for "8' Telescoping Installation Pole, 9248" is 1. Minimum quantity for "10' Telescoping Ceiling Sign Installation Pole, 9250" is 1.